We are big believers in breakfast. Gourmondo dishes up a variety of offerings, including nutritious yogurt parfaits, filling egg frittatas, and buttery pastries made in-house. One of our most popular items, the Gourmondo Egg Bomb, is our original, bread-free spin on a breakfast sandwich. Essentially an egg baked in a crispy ham shell, this breakfast of champions packs a protein-rich punch to fuel your day deliciously. We developed the Gourmondo Egg Bombs based on requests for more gluten-free and Paleo items that were also high in protein. Gourmondo Egg Bombs offer the same ease and portability of our breakfast biscuits without the need for bread. Order them for your next breakfast meeting or special event. Or we’ve detailed the recipe below should you like to bake them at home. You’ll ace your next breakfast or brunch with these irresistible, easy-to-make treats. 2. Lightly coat your metal muffin baking pan, or other metal baking vessel with oil. Drape ham into each muffin cup/baking tin, forming a cup with the ham. Trim the ends so that there is a little overhanging, but not much. 3. 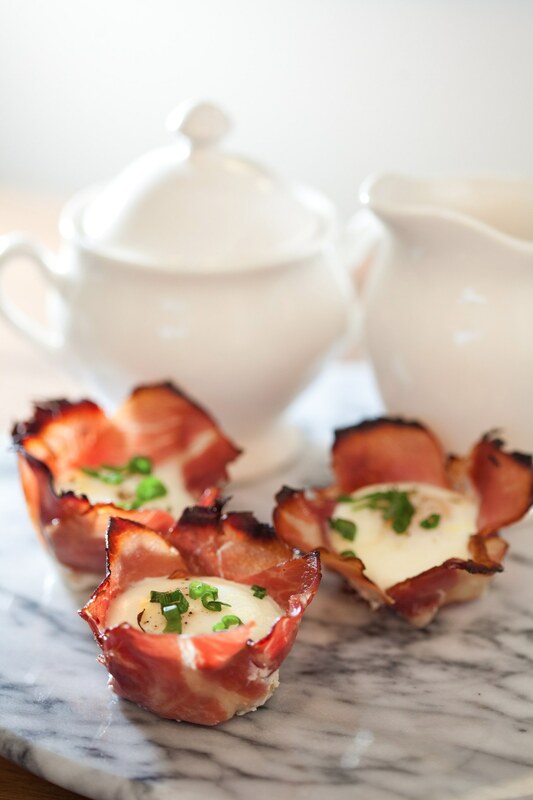 Crack one egg into each ham cup. Lightly season with salt & pepper. 4. Bake for approximately 9-11 minutes—this will vary with different ovens and depending on how you like your egg cooked. For an over-easy egg, you want the egg to be firm and the yolk to be just cooked. Or, if you prefer an over-medium egg, you can cook the egg all the way through leaving the yolk still runny. You will need to play with the timing – it’s worth it to get the eggs cooked to your liking. 5. Remove gently from the pan while still warm. Garnish with scallion slivers.